When Imogene Drummond arrived at MICA's Mt. Royal School of Art in the early 1980s, she was the only person in her class who didn't have a BFA. After graduating with an MSW from Catholic University in Washington, DC, Imogene had been working as a family therapist and taking art classes; what motivated her to attend MICA was less actual experience as a painter than the desire to be one. At first, the open studios at Mt. Royal were intimidating, and although the environment was designed to invite critiques, no one said anything to her about her work. Imogene was thrilled when a fellow student eventually gave her painting a harsh review. "My work had progressed enough that I could finally be critiqued," she said. "I knew I had finally been accepted as a fellow painter." Imogene describes her life and work as a "solo journey," which is why she values her connection to MICA and her role as a member of the Alumni Council so deeply. "MICA allows people to develop their own voices artistically. It encourages innovative thinking that's grounded in reality - it promotes innovation that's connected to the world around us, not just innovation for the sake of it. An artist coming out of MICA will be a thinking artist," she said. Calling MICA a "model institution where credit and respect are freely given," Imogene says she gives to the school because it is so dedicated to the growth and development of its students. "Giving to MICA adds meaning to my life." It is the same fearlessness that drew Imogene to MICA that has led her to a life as a painter, photographer, writer, filmmaker and world traveler. She is even a member of the prestigious Society of Women Geographers. Shortly after graduating from MICA, she found herself drawn to sacred sites and archetypal symbols and began taking painting expeditions to sacred sites around the world. She now lives and works in New York's Hudson Valley, which she loves for its "beautiful landscape and great artistic history." She also makes regular forays to the West Indies, where she has been a painter in residence at the Balenbouche Estate in St. Lucia since 2000. For more than 20 years, Imogene's work has been shown in solo and group exhibitions from New York to Australia. 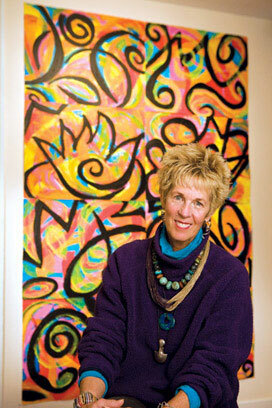 Her paintings are in private, corporate and hotel collections, as well as the National Museum of Women in the Arts in Washington, D.C. Her current project, Divine Sparks, is a departure from her usual medium. She calls the 30-minute video a "21st century myth-of-creativity for children of all ages." It uses a broad range of artistic mediums, from dance to animation, to "provide an alternative to promoting violence in our culture." Imogene sees MICA's expansion as an institution as focused on the growth of its students and said she is impressed by the "integration of their value system." Describing President Fred Lazarus as a "visionary," she said, "An Alumni Council member asked Fred what his definition of success is and he said that for him, students and alumni are successful when they lead the lives they choose to live."